I was walking out of the dollar store with my little purchase and heard the cashier say to the next customer behind me, “Shatsa, huh?”. I stopped in my tracks and pivoted to turn back towards the drink section. I thought Shasta was long gone but it may be a regional think like Mellow Yellow. I bought my 4-pack of Shasta and stopped at a mini-mart on the way home for a Coke and a Pepsi for evaluation. As I probably have mentioned before, Ethan is a huge Coke fan and I’m a Pepsi girl, somehow we are happily married, but I knew we would both probably be biased so no big surprise that Ethan enjoyed the Coke and stated it’s a “good, solid cola”. Although he finds that Coke in a can has some sort of faint aftertaste that is not present in bottled Coke. I think Coke is good, I’m not one of those people that act like their world is turned upside down when a server asks them “is Coke okay?”. It’s a decent cola product. Without thinking about the name I actually thought “this has extra ‘pep’ to it”. Ethan thinks Pepsi is a “semi-tone higher pitch” than Coke. Seems slightly sweeter too. There is just something about Pepsi this is subtly more interesting. I don’t know what it is but I just like it. Shasta was surprisingly watery compared to the previous two. The cola flavor was much less intense and was a little soapy or something. We kept trying to find adjectives for this but it was just so void of flavor and substance that we just kept looking at each other and srugging our shoulders. Coke and Pepsi definitely are more substantial colas. After that I think it just depends on your blood type or something which one appeals to you more. Shasta unfortunately was not the treasure I was hoping it would be and because of it’s flavor deficiency, we agreed it was the second rate version of the two better known colas. Maybe because it was ancient Dollar Store Shasta? Most brands manufacture to a lower standard for deep-discount stores like dollar general and dollar tree. Or they just get their old crap from who knows where. Should try this again with HEB cola and Sams Cola too though! I agree with jdeuel. You should compare Coke and Pepsi to other store brands. I find Sams cola compares favorably to Coke, while Kroger cola reminds me of Pepsi. Have you tried Pepsi Throwback? i’m definitely a Coke girl at heart, but i’m hooked on the Pepsi Throwback. definitely give it a try – soon, though, since it’s only available for the summer. Ooh, I can’t wait. I heard that Pepsi throwback was coming but I haven’t seen it yet. I’ll be on the look out! Nothing’s better than an ice cold can of coke! But when there’s a choice between fountain coke and diet pepsi, I always have to get the diet pepsi. There’s just something about it that tastes sooo good!! Coke in a can or via the fountain at my local pizza shop helped me survive the last trimester of my pregancy. But I like Coke Zero better from a bottle than a can, even though I prefer regular Coke from a can and not a bottle. WTH? There´s nothing better than Coke, preferably if it comes from a 20oz plastic bottle… Coke is my favorite by far! Oh and by the way, could you do a choco-chips cookie rate… that would be good to read. I hope the Pepsi Throwback idea catches on, and Coke offers a sugar version soon. I’ve always been partial to Pepsi, except when I’m mixing with Bourbon. Then it’s Coke. I’m a Pepsi person at heart, as well. Pepsi and Coke started tasting a lot more alike when Pepsi switched to corn syrup, so I was saddened by that. The remaining key difference from what I understand is that Coke uses orange as its citrus note, while Pepsi uses lemon. I never liked Shasta cola! I liked Shasta’s other flavors such as lime and orange. Shasta cola tastes like watered down Pepsi cola. 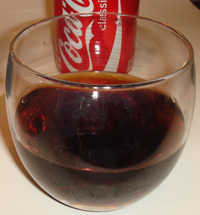 The best tasting cola has to be Coke and its other flavor variations. My favorite is Coke and Lime. Shasta Cola is not sold enough to test with these. 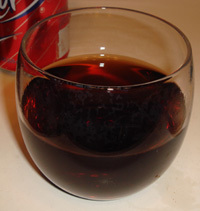 Even though Sam’s Cola is a store brand, I think you all should test it with coke and pepsi. RC Cola should have been put in the mix. It’s hard to find but a lot of people prefer it over coke or pepsi! If you ever do a diet cola run-down, I would totally suggest Safeway brand (or whatever supermarket name Safeway goes by in Mass…) diet cola. Haven’t tried their full-calorie, but for my money, their diet is the best in the game. Although I’ll grant that that’s because it’s super-ultra-almost-painfully carbonated, which might be more appealing to me than to most, because I’m a total carbonation freak. Agree with Russell above: Royal Crown Cola. Two of us in the small office where I work prefer RC. I just don’t buy it very often. In fact, the last time was about, say, four years ago after I had a violent adverse reaction to some mushrooms (everybody else was fine — it was just me), the only things I felt like eating for a week were Zagnut bars and RC Cola. I shun Coca-Cola. To me, it is just out-and-out awful. While mostly drinking Coke products now(my roommates are so stuck on it now it’s ridiculous), I started with Pepsi, and will always be a “Pepsi Man” myself. Regarding the “Can versus Bottle” question, I would have to go with the can, hands down. Simply because I’ve always loved the fact that you can’t get that same “icy cold rush of carbonation” that you can get if you pop open a can, and slam it back all of a sudden, when you drink out of a bottle. I can’t even vote for this! Because I go in between the two for my favorite! I don’t drink soda often, but when I’m craving a cola…it will be either for one or the other! Either I’ll crave the lemony bite of Pepsi or the sweet, syrupy Coca Cola. Either way, aren’t we blessed we can rely on these companies to deliver safe, quality products consistently? Unlike companies in some other countries. If there is one place left on earth where you can get Coke,Mtn.Dew,and a variety of fruit flavored sodas along with randomly assorted rootbeer and cream sodas it’s the Old 52 Store in Sabin,MN. Getting back to this though, Coke is often found around my house, and so does most of the Shasta flavors, usually something other than cola. You might see Pepsi about twice a year,and even then it doesn’t last long. And that is because I’m practically the only person in the family who drinks Pepsi. That being said, it isn’t usually really Pepsi or any form of it. If Pepsi products are in my house,it’s usually either Mtn.Dew or Pepsi Max. That being said,I have a question that you can all blab away at. How many of you consider any soda that is brown a cola who isn’t me? i.e. Coke,Dr.Thunder,Pepsi Max Cease Fire,and Pibb Xtra. Go ahead. Respond. Blab away. Russell, RC might be harder to find, but maybe it has to do with the fact that all of the Dr.Pepper/7UP products (Dr.Pepper, 7UP, RC, A&W, Schweppes, Canada Dry, and Sunkist, among others.) are hard to find, even though they are in large supply here in Minnesota. 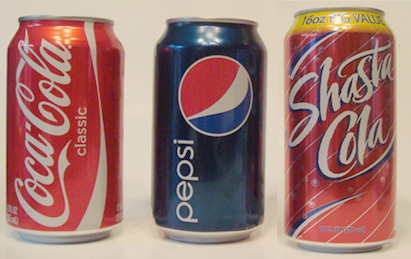 I’d say maybe put the battle this way: Coca-Cola vs. Pepsi vs. Shasta vs. RC vs. Sam’s Cola. Final Standings: Pepsi, Coke, Sam’s, Shasta, RC, though I will admit I’ve never had RC. If you get a 12-pack for RC, don’t get the red one unless it’s like Cherry Coke vs. Wild Cherry Pepsi vs. Cherry RC. 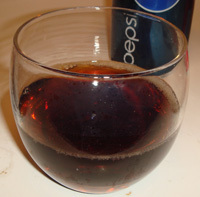 I honestly prefer Pepsi but since Coke and Shasta are ussualy in my house if there’s no Pepsi I’ll be fine anyways. 4 words:Coke and Shasta suk. I love Pepsi! Honestly I could not really care they both are okay to me…… Shasta ewww the thought of shasta yuckk i hhate it! Also,Shasta Cola is in my house more than Pepsi. LOL. Shasta has taken over Utah. They have giant 2-liters of it everywhere. I am a Coke lover. Pepsi has always been a distant second. I just tried Shasta yesterday and it is going to become my regular drink. Don’t get me wrong, Coke will always be number one but 2.5 litres at the dollar store compared to 1 litre of Coke. I can live with that.